Need a new battery for your FIN e-cigarette? Great news, you don't need to buy a whole new FIN Starter Kit, you can now just buy the individual component you need: the battery itself. The FIN battery is fully compatible with the regular FIN Starter Kit and lights up with the signature FIN white glow. Your FIN battery should take around two hours to charge and will deliver around 300 puffs per charge. Fin tobacco refills produce the same (slightly) sweet tobacco taste found in Fin disposable e-cigarettes and in the Fin Tobacco Starter Kit. Fin tobacco refills are the equivalent of approximately 200 cigarettes, so using Fin e cigarette refills can be as much as 85% cheaper than smoking cigarettes. A very cool e-cigarette brand with a distinctive tobacco taste and excellent packaging, style & overall theme. Please note, as well as buying new cartridges for your FIN Starter Kit, it is recommended you change your FIN e-cig battery every 6-8 weeks depending on use. Not my Favorite and batteries don't last. These have worked great for me. For getting off the real thing it has been great. I don't believe that they are represented as a refill being two packs. It took me 3 days to smoke a pack and one fill last maybe a day. And ordered two extra batteries. They wont charge but enough for a few puffs. Sorry looking for a change. Smooth and relaxing.A good product. Smoker for 30+ years and this product has helped me quit for 4 years now. Quit smoking with these 5 years ago. Closest taste to Marlboro lights I have ever found. The flavor of this product was just what I wanted. The price for the quality of the product is good compared to others. Love this so much because my E-cig brand went out of business this is the closes brand that taste like them. I think China put them put of business. I love Fin and if they ever die I'm going to be petrified!!! I enjoy these cartridges, however they don't seem to last as long as stated. And every so often they leak. great service and great value. very happy. The last shipment 2 5 packs were not good. Nothing in them. Dry disapointed. I had a hard time finding this brand of cartomizer in stores, and an even harder time finding a reliable source on line. Then I found Elecronic Tobacconist. And I'm sure if my current brand becomes unavailable I trust they'll have a comparable substitute. They have an amazing selection of products. I have been using Fin for 3 years now and I love the similarity to a real cigarette. Also the cost is very low in comparison. I have tried other brands but always come back to Fin. very very HAPPY with my Fin disposable. 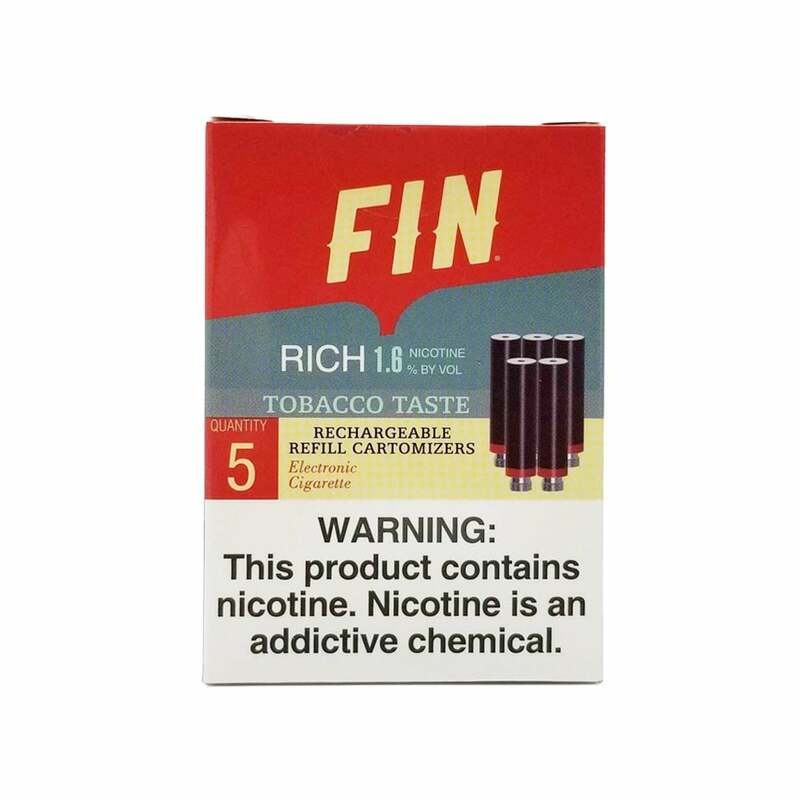 FIN is my preferred brand of e-cigarettes, but they are hard to find. Frequently out of stock. This company has is very easy to order from and often has products that others don’t. Delivery was fast and product was as good as promised!